Offering you a complete choice of products which include gyratory screen separator. Gyratory Screen Separator are circular shaped screen separators that are ideal for solids/solids and solids/liquids applications. These consist of specially designed motor which is mounted vertically at the center of the base plate of the screen. It is placed in between feeding hopper & bowl. 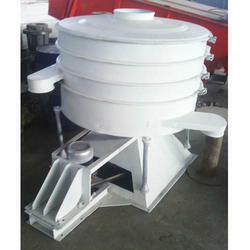 Looking for Gyratory Screen Separator ?